Cut fruit in half and remove stones. Toss fruit with a drizzle of oil and grill on BBQ, cut-side-down, for about 4 minutes, then flip and cook a further 2 minutes, until warm through and golden. Sprinkle with brown sugar and cook for a further 30 seconds each side, until caramelised. 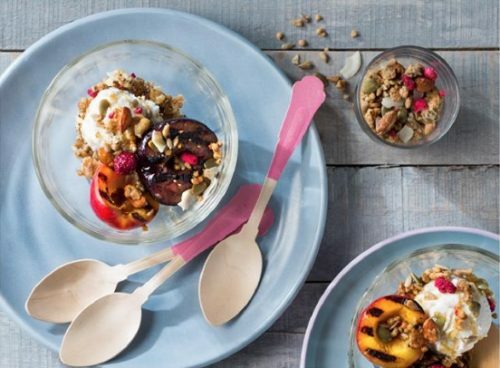 Place fruit into bowls & top with vanilla ice cream or yoghurt and sprinkle with raspberry & maple nut nograin-ola.